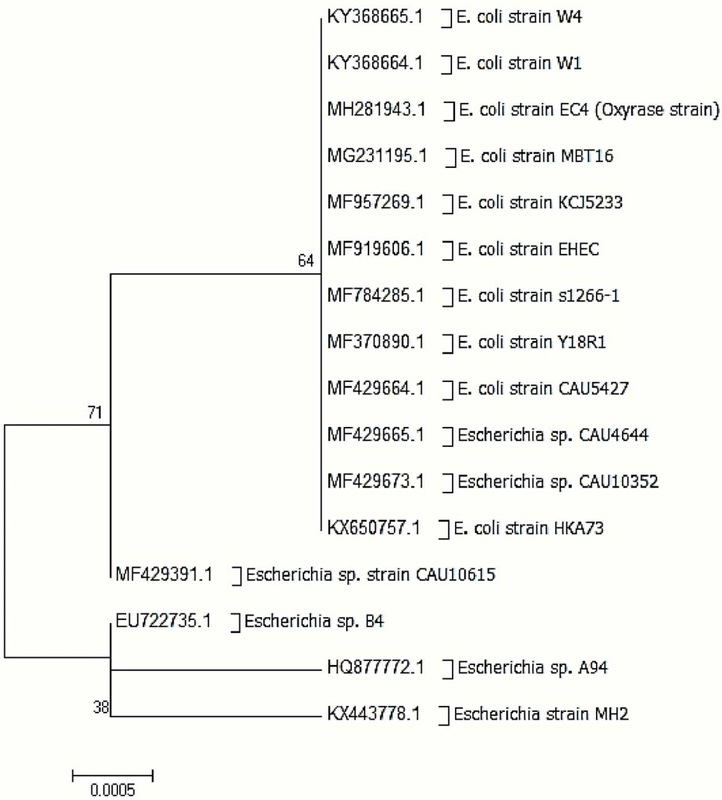 Phylogenetic tree showing evolutionary relationship between isolated E. coli strain EC4 (oxyrase strain) and some reference strains. The number at the branch nodes indicates bootstrap values (%) based on 1000 replication. 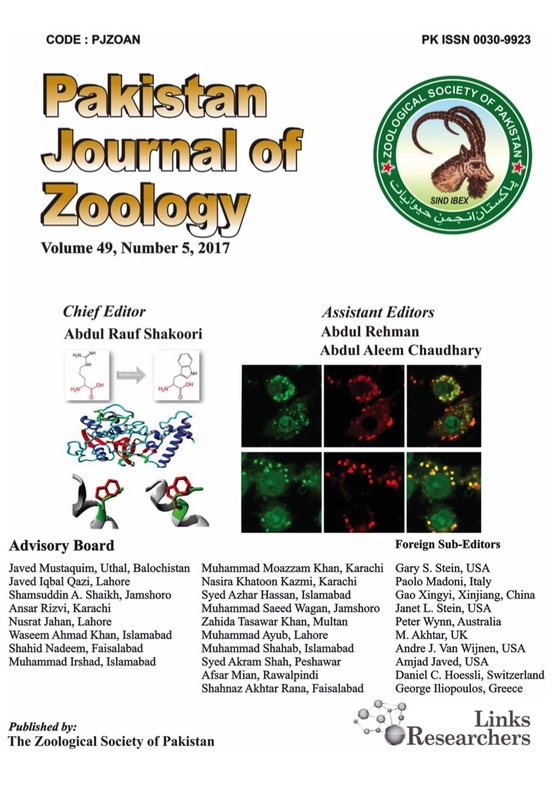 The scale bar represents 0.0005 nucleotide substitutes per position. 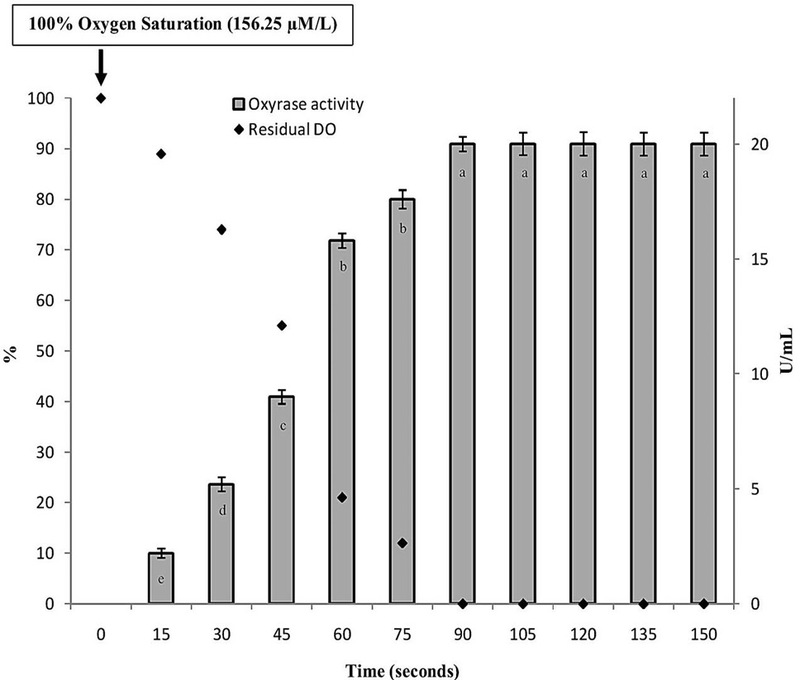 Effect of time on oxyrase activity (emulsiflex mediated prepared membrane fragments); 57°C temperature, pH 8.5 and 25mM lactate as H+ donor. Y-error bars represents the standard deviation among the triplicates. Each value is an average of three replicates, data labels followed by different letters differs significantly at ∝=0.05. 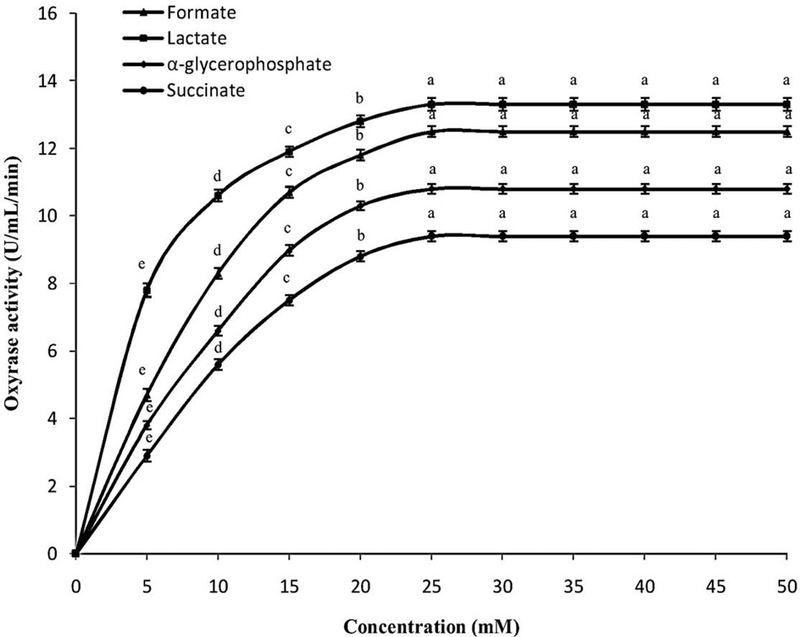 Effect of initial concentration of H+ donors on oxyrase activity; time 1.5 min, 57°C temperature, pH 8.5. Y-error bars represents the standard deviation among the triplicates. Each value is an average of three replicates, data labels followed by different letters differs significantly at ∝=0.05. 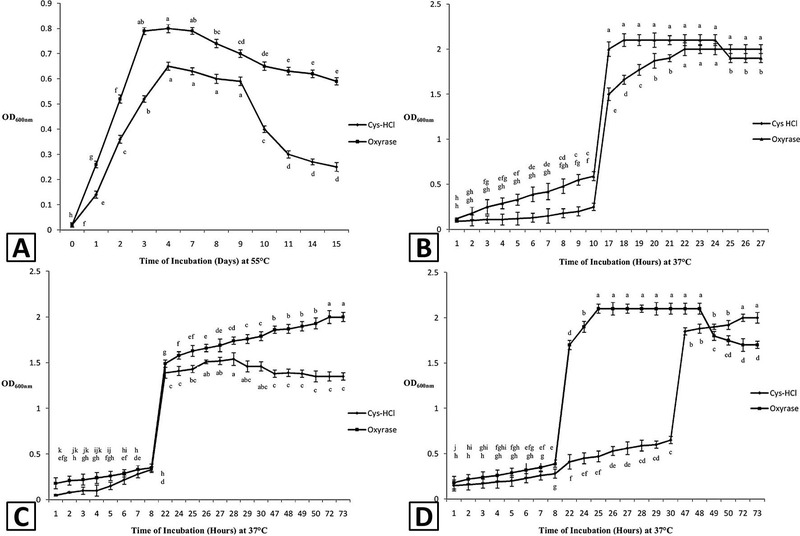 Comparison and effect of Cys-HCl and E. coli oxyrase on growth pattern of Anaerobaculum hydrogeniformans OS1 (A), Akkermansia muciniphila (B), Bilophila wadsworthia (C) and Roseburia intestinalis (D). Y-error bars represents the standard deviation among the triplicates. Each value is an average of three replicates, data labels followed by different letters differs significantly at ∝=0.05. 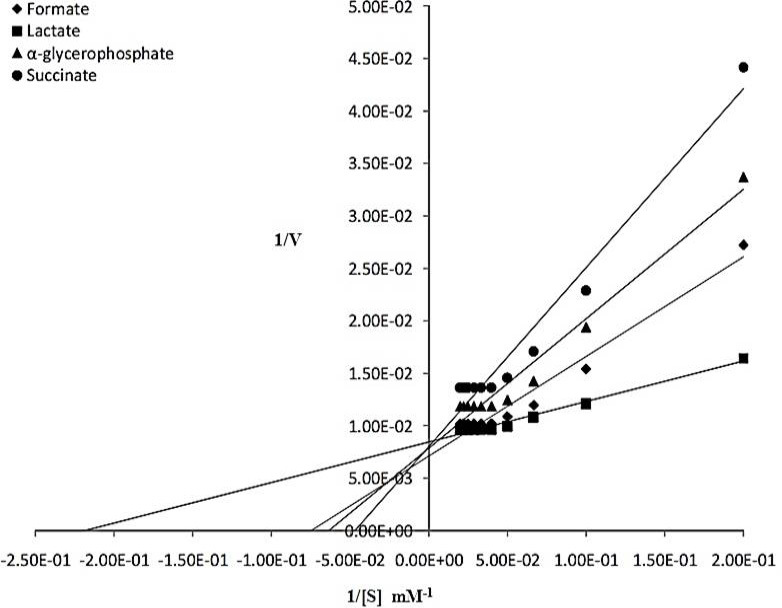 Double reciprocal Lineweaver-Burk plot between inverse of V and inverse of different concentrations of various substrates for emulsiflex prepared oxyrase membrane fragments at 57°C, pH 8.5 and time 1.5 min.